Reading! My nose is always in a book or magazines. And since we now live in a digital era I also browse the Internet for the latest news in fashion, beauty and entertainment. I don't skim over content to (just) fixate on the luxuriousness of editorial photos, I actually read what's before my eyes -- every word. Positive, constructive commentary is informative and prompts me to explore beyond my own thinking. Fashion! Place your attention on the woman in head-to-toe black chatting on the phone. Fierce look, right? The color black will forever be classic and chic. Admittedly, I've been playing with color over the summer, especially with green color palettes and a variety of prints. However, the days (and nights) I did/do wear all black, the compliments were endless. The Bottom Line: wearing a black outfit is flattering and gives the confidence level a boost...and if you feel good; you look good. Fun! Whether it's online or in-store, boutique shopping is incredibly fun. Lately, my girlfriends and I have had plenty of chat-and-chill lunches where we would stalk the "what's new" section of Websites on our laptops, like shoptiques.com. Why the plug? Well. SHOPTIQUES gives its customers options. 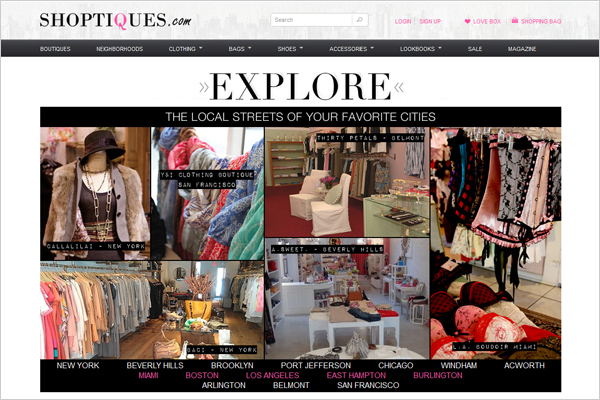 Meaning, you can actually shop online by boutique in a selected city. Boutique shopping is a super fun and fantastic idea for a Girls Night In, or Out. I mean, who doesn't love shopping?